Don’t miss this special presentation by the San Diego Zoo Horticulture team on 100 years of zoo horticulture. They will discuss the many landscape changes and developments in the last century that contributed to the San Diego Zoo being named in 2015 the number one zoo in the world by the TripAdvisor Traveler's Choice Awards! The presentation showcases the significant horticulture events, starting in 1916 with the founder Dr. Harry Wegeforth's dream to create "a capacious sylvan zoo with a luxuriant growth of trees" to today's accredited horticulture collections and far reaching conservation efforts. The speakers explore the zoo’s early history, significant horticulture events, showcase the extensive plant collections, the critical browse program (growing plants for animal health and welfare), and review their involvement in international plant collaborations and conservation efforts, illustrating how the San Diego Zoo still flourishes after 100 years. Stephanie has over 35 years of professional horticulture experience. For 18 years she was the director of horticulture at SeaWorld before joining the horticulture management team at the San Diego Zoo Safari Park in 2012. In January 2015 she became the curator of horticulture at the San Diego Zoo. 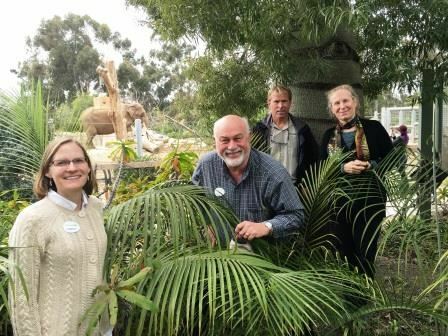 Of the numerous projects and garden installations she has been involved with, she is pleased to have been part of the Tull Family Tiger Trail project team at the San Diego Zoo Safari Park; an outstanding immersive exhibit that won the Association of Zoos and Aquarium top awards in 2015. Stephanie's passion for learning about plants and native habitats, designing natural settings, and implementing conservation plans was first inspired by her dear friend and early mentor Chuck Kline, the first SDHS Horticulturist of the Year recipient. Dan began working at the San Diego Zoo in 1971. Starting as a tree trimmer he climbed and pruned the zoo’s big trees and also salvaged useful limb materials for exhibit use. Currently, he is an ISA certified arborist and a manager in the Horticulture Department. He oversees a four person tree crew and an eight person crew of horticulturists who produce tons of dietary foliage per week to support the zoological collections. During his long career he has consulted and traveled to a variety of countries for a variety of zoo related assignments. He is an author and contributor of many articles and photos to Zoonooz Magazine. Dan has served on the Professional Tree Care Association Board since the 1990's, has served several terms on the City of San Diego Community Forest Advisory Board, and was an adjunct faculty member of Cuyamaca Community College for over 20 years, teaching arboriculture and related horticultural fields. Michael G. Letzring, born and raised in San Diego, graduated from Mesa College with a degree in ornamental horticulture. He has been pursuing this career with a passion since 1981, first as a foreman on commercial projects, then as owner of his own landscape business, and later in various leadership roles at the San Diego Zoo since 1996. As a collection specialist and Senior Plant Propagator, Mike has become an expert in Hawaiian native plants, Erythrina, cycads, palms, Madagascar plants, caudiciforms and other succulents, and many other plants and accredited collections at the Zoo. His fervor for unique plants and naturalist displays that best showcase our conservation efforts is evident in many areas of the Zoo. Christy Powell began her career as a plant propagator at the San Diego Zoo in 2002. In that role, Christy was responsible for diversifying and broadening the Zoo's botanical collection and browse program by employing multiple methods of propagation. In 2007, she became focused on Erythrina species (coral trees) and became the specialist for that collection. Christy was promoted to Horticulture Supervisor in 2015 where she oversees nursery and propagation operations, botanical records and collections, pest control and special events. She is a certified Zoo Horticulturist and has been involved in the Association of Zoological Horticulture (AZH) for 9 years, serving as the Chair of the AZH Conservation Committee. Christy has participated in multiple facets of conservation science including micropropagation, seed collection and storage, plant care, recording keeping, DNA barcoding, importation /exportation, collection management and field conservation projects in California, Hawaii, and Palau. Christy received her BS in Horticulture Science from Purdue University, and her MS in Agricultural & Extension Education also from Purdue. Please note that this outstanding presentation will run a bit longer than our normal program.